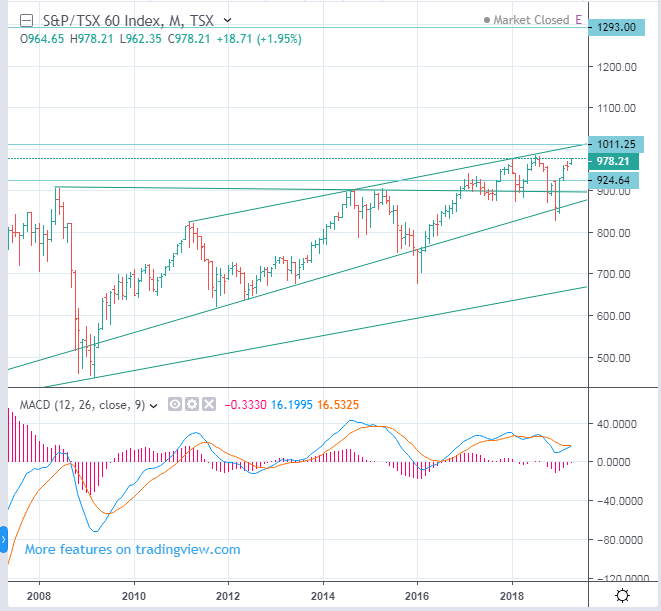 Will the Canadian stock indexes go up? Experts say the Canadian stock indexes are heavily influenced by real assets such as gold, crude oil .... I do not know whether those opinions are right or not. In my opinion, Canadian stock indexes are likely to rise. In the long term, the TSX 60 index is likely to rise to 1545. If 1545 is too high, then I will say 1293. A very important price line for the TSX 60 Index is 1011. If it rises above 1011, it would be right to think of 1293. Of course, it will take many years to reach 1293 or 1545. In the short term, the support line is 925. What we should be interested in is whether the TSX60 rises through 1011 strongly. I do not know if people will agree or not. That's what I see.